20" Silk Designer Christmas Stocking Personalized on Green Velvet Cuff. Flocked Silk Stocking body with Olive Velvet Venetian Ruffle Cuff and Metallic Gold Trim. 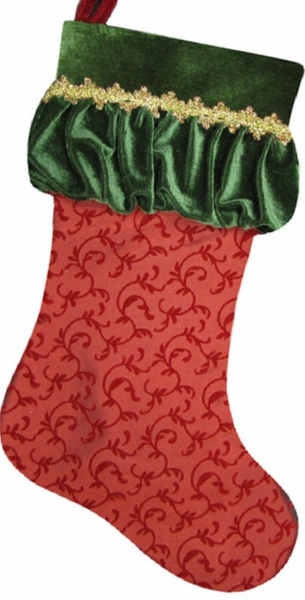 We have a same personalized stocking in green so you can make a set. Materials: Flocked Silk Christmas stocking body with olive green velvet Venitian ruffle cuff, trimmed with sparkling gold metallic ribbon.